Note – This article is not intended to supplement or replace any components of an ANSI or OSHA standard, it is for general information purposes only. Workplace Health and Safety and the provision and utilization of safe working practices is generally regulated by OSHA – The Occupational Safety and Health Administration. The body who oversees the actual equipment used for first aid applications in the workplace is ANSI – The American National Standards Institute. It is important to understand how these two Federal bodies interact and how they impact Occupational Health and Safety Requirements. Let’s start by taking a look at ANSI requirements for the first aid industry. ANSI sets down a regulatory standard which relates to minimum acceptable performance standards for workplace first aid kits and supplies. (ANSI/ISEA Z308.1-2015) In this standard, an assessment has been made of the typical type of workplace injury which might occur, and a minimum standard for applicable first aid supplies and equipment has been determined. From the perspective of plant management, safety managers, company management or business owners, this is the standard which must be adopted when determining what equipment to make available in the workplace to deal with accidents and injury to personnel. The standard comprises mandatory stipulations alongside non mandatory recommendations which are to be implemented at the discretion of Safety Managers. 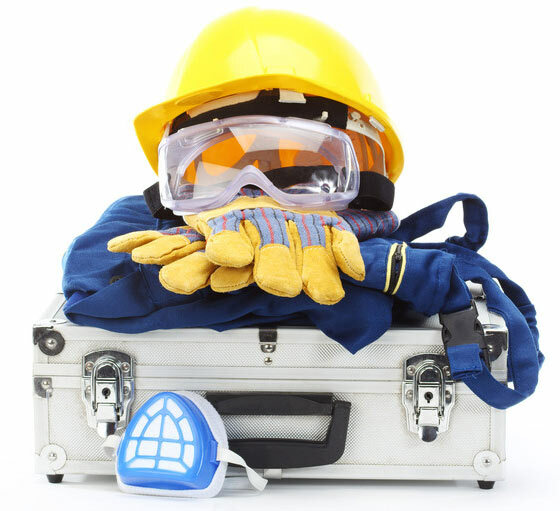 In simple terms, mandatory first aid equipment is to be provided, in compliance with OSHA and of a standard compliant with that determined by ANSI, but it is also a requirement that management give due considerations to the specific environment and take any additional steps necessary to provide access to requisite safety and first aid items. What this means is simply that each workplace has its own particular set of circumstances and this must be taken into consideration when providing first aid supplies, kits and van delivered first aid restocking services. For example, it could be that a specific working environment exposes employees to the risk of contact with harsh and/or toxic chemicals. In this instance it is incumbent upon safety management to perform a risk assessment and to provide first aid supplies suitable for treating injuries incurred from the specific risks involved. These might by certain types of eyewash stations, specific types of adhesive bandages or burn treatment stations. Though the requirement on performing this risk assessment is recommended, and not strictly mandatory, it exposes plant management to the potential risk of a law suit or civil action if all reasonable assessments and subsequent access to first aid routines and equipment has not been provided. Under the Mandatory requirements, first aid kits and first aid supplies are categorized and classified based on their scope of utilization and the quantity held in stock. For example, in a larger industrial situation with many employees, it would be expected that an extremely broad range of first aid supplies be on-hand and contained in sufficient quantities to provide simultaneous treatment to multiple employees. Typically, first aid supplies relating to burns, wounds, cuts, abrasions, gashes, impact wounds, strains, sprains etc should be maintained. In an environment where employees might be susceptible to eye injuries then eye wash stations and other specific first aid equipment should be on hand. This list is not comprehensive and it is a requirement under OSHA and ANSI standards to understand what the full legal obligation pertaining to the stocking of first aid supplies actually is. Though beyond the scope of this article to cover in detail, it is worth pointing out that ANSI standards makes provision for two classes of first aid kit – Class A and Class B. These first aid kits are developed for dealing with common occurrence injuries in the workplace and are general and non specific. They will contain such items as bandages, splints, eye-wash, pain medication etc, and are suitable in most workplaces. The ANSI Class B kit is a more specific first aid kit designed for higher-risk environments where specific types of work situations present hazards not catered for in a Class A first aid kit. The contents of Class B first aid kits are generally determined by a factory risk assessment. By obtaining the current edition of the ANSI standard you will have access to pertinent information alongside tables and charts, to help make an assessment and a determination on what is required for your specific environment. 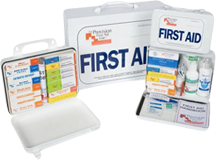 Of particular interest to First Aid Distributors is the requirement that first aid kits should be regularly inspected. The periodic inspections are intended to ensure they they are maintained in good condition, that supplies are replenished according to use, and that contents are valid and have not expired. It is the legal requirement for plant safety management to facilitate this inspection but it is quite common for the independent safety and first aid supply distributor to play some role in the process. When doing so it is prudent to protect oneself from the prospect of any adverse legal action in the event that first aid supplies are required, but for whatever reason are unavailable. This contingency needs to be included for within your business terms and conditions. Generally, offering advice and specific types of ad hoc support should be avoided if the workplace situation is more demanding or complex. Pointing to the specific requirements of OSHA and/or ANSI is generally sufficient in demonstrating to plant personnel what is required of them under the law. Suggesting exclusions or making unregulated dispensations should be avoided. For those Plant Management reluctant to invest in the requisite safety and first aid equipment, it can generally suffice to point to the Occupational Safety and Health Administration’s (OSHA’s) medical services and first aid regulation (CFR) 1910.151(b). Pointing and directing staff to the applicable standards ensures that the distributor or first aid vendor does not incur any legal obligation outside of supplying ANSI rated supplies and equipment. As a ‘The Provision First Aid Line’ Distributor, you will receive guidance from us in terms of representation of the product lines, access to useful resources and information on the various applicable standards, and we can help you deal with any concerns you might have concerning any and all legal obligations pertaining to your first aid supply business. We provide you with access to all state of the art equipment including AEDs and ensure you are fully supported vis a vis training and legal requirements. Contact us today to learn more about becoming a ‘The Provision First Aid Line’ Distributor!